Happy Monday! I hope you all had a wonderful weekend! We had a great weekend of festive fun, including the annual Christmas parade and a visit with Santa. Speaking of motherhood, once I become a mother, comfort became key when it comes to getting dressed. Who doesn't want to be comfortable while looking put together?! 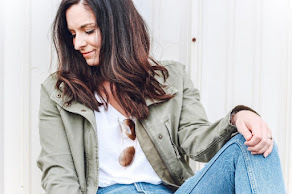 I've recently rediscovered Lularoe from Jenna Green and I am so excited to share with y'all how I styled three amazing pieces from a great company! Be sure to scroll to the bottom of this post for details on a fun giveaway. If you're on Facebook (or any social media for that matter), I know you've seen your friends post about Lularoe. They are either selling the brand themselves (yay for girl bosses) or they are hosting a pop-up party. I've seen so many of my friends get excited about getting dressed again thanks to Lularoe! Confident women are definitely happy women. They are also offering clothing for men and little girls, too! I think my girls definitely need a few Lularoe pieces of their own. Jenna sent me a Carly dress, Sarah cardigan, and their famous one size leggings to style for y'all! 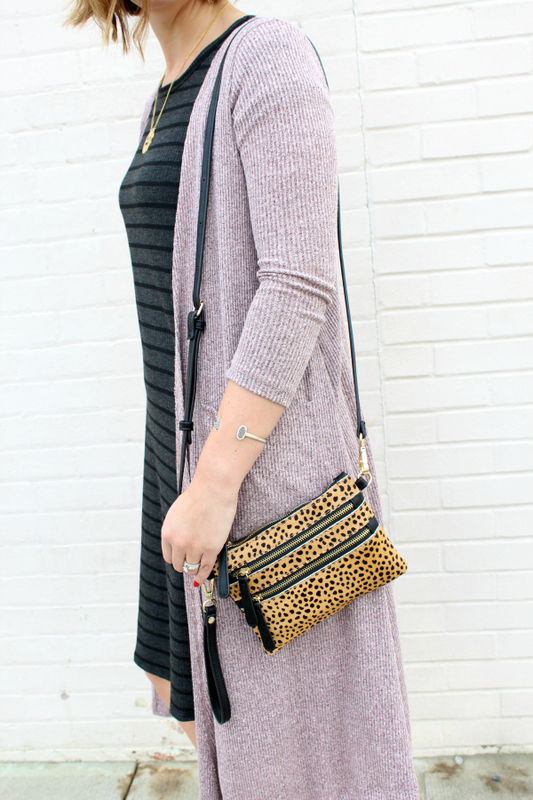 I styled the Carly (a swing dress with a high low hem) with the Sarah (a duster cardigan), black ankle boots, a leopard bag, and a monogram necklace. The Carly and Sarah combo is beyond comfy! For size reference, I am wearing an XXS in the Carly and a XS in the Sarah. Stay tuned tomorrow to see another way to style each of these pieces in their own outfits with pieces I already had in my closet. I have always wanted to try the Lularoe leggings so I was thrilled when Jenna sent me a pair to style! They are even softer than I imagined and you literally feel like you aren't even wearing pants because of the comfortable waist band. Leggings can be pants, y'all! Just pair them with a dress, tunic, or long sweater and you're good to go. I styled this dusty rose pair of one size leggings with a cozy cream sweater, rose gold necklace, glitter flats, a black tote, and my favorite leopard scarf. I want to wear these leggings everyday! I'll definitely be back for more. Want to win your own Carly dress? Head over to my Instagram page to get all of the details. Follow myself and Jenna, and tag a friend who would love Lularoe or join Jenna's VIP group on Facebook and comment on the giveaway photo. The winner will be announced on Tuesday, December 6 at 9pm EST! I love both styles! Those leggings look fabulous and I am loving those sparkly flats girl! P.S. I also have a tattoo on my foot! Love these looks! I LIVE in LulaRoe! Their stuff is so cute and comfy! I loove both of these looks! Um those gold shoes are amazing. I need those in my life. You look so cute in both of these outfits! I love those leggings and that dress is so cute! I've heard nothing but the best about Lularoe! It all looks so comfy! Love the color of those leggings, especially with your flats!